Yippee!! It's my 50th Post. I never realized till yesterday that this was going to be my 50th Post of the blog. It's been quite an awesome blogging journey, with new blogging friends and new recipes to learn and try each day. It gives me a great feeling, when people try my recipes and give me feedback. Coming to today's post, it coincidentally happened to be a Payasam recipe for celebrating my 50th post. Actually I have prepared this for Ganesh chathurthi special recipes. I tried my level best to give justice for my mom's recipe and I love to have it with banana. Here, we go for the detailed steps. 2. In a pan add the ghee and roast the raisins, cashews till it turns golden brown. Remove it and keep it aside. 3. In the remaining ghee, add the cooked moong dal, javvarisi and grated jaggery or jaggery solution(jaggery dissolved in water). Once the jaggery mixes well, add the cardamom powder and stir it. 4. Now add the thick coconut milk and bring it to single boil. Switch off the flame after adding the ghee roasted cashews and raisins. You can cut the coconut pieces finely and add at the end. It gives an awesome flavor to the Payasam. Switch off the flame within few mins after adding coconut milk, else it may start to curdle. God !! 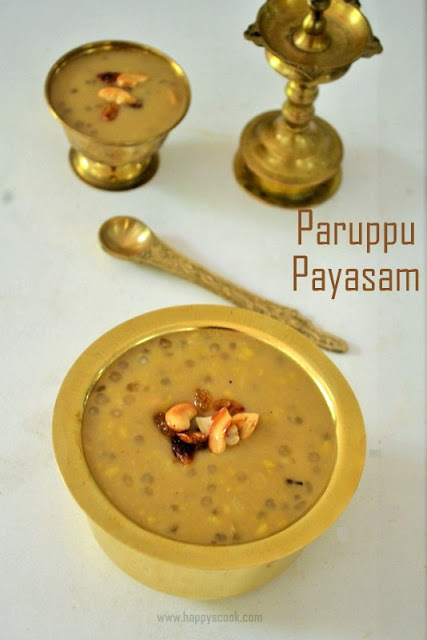 i am seriously craving for some payasam right right now !!! Very delicious payasam and congrats on your 50th post. Sago and pasi paruppu payasam .. Aaah bliss indeed! Congrats dear. Lipsmacking good moong dal payasam.